The projects are still going strong over at the Imaginisce blog. 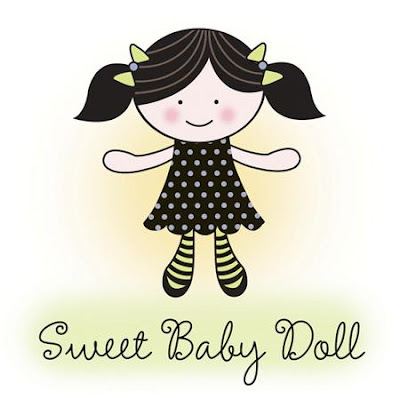 The Design Team worked hard creating many wonderful projects using the "Little Cutie" collection. Yesterday I shared projects using the boy themed papers and today I'm happy to share some projects that I made using some of the girl themed products. This 1st one is an altered canvas. I took a plain white 8x8 canvas and painted the edges (and approx 2" in) with cream acrylic paint. Let it dry. Then I took some patterned paper & cut it slighter smaller than the canvas size. I used my distressing tool around the edges and then inked them with a yellow ink pad. I then used my Cricut and some Core'dinations cardstock to cut out the purple & white scalloped frame. 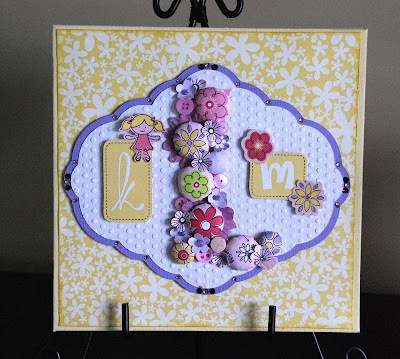 I embossed the white piece using my Cuttlebug. I decided to make this for my daughter's room and used her initials on it. I cut out the "K" and "M" from some patterned paper. For the large "L" I printed an L shape out on white paper to use as my template. 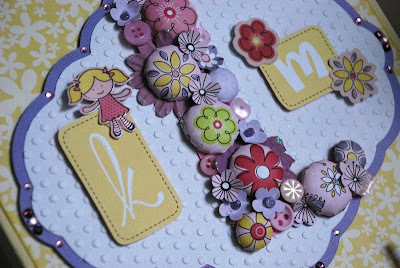 I then covered it with small punched out flowers, buttons, flowers and used my i-top to make small and medium sized brads. I then used my i-bond and some of the glitter glue (purple) and added a dot of glue to the purple patterned punched flowers. I finished my project off my adhering some rhinestones using the i-rock too. My next project I made these little booties. I've seen these before and always wanted to make them and this was the perfect time. I found this template online (*see template links near end of post). I traced the design onto my paper and adhered the shoes into shape. 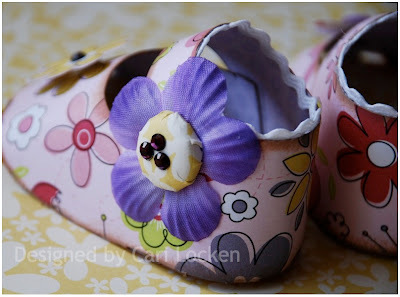 I used my i-top tool to make 2 brads, adhered them to a purple flowers and attached these to the sides of the booties. I then used my i-rock tool to add 3 rhinestones to the center of each brad. I used my i-bond to adhere some white rick rack to the inside of each bootie as well. Still wanting to add a bit more I decided to cut out a yellow flower from the patterned paper and added that to the top/front of each bootie. 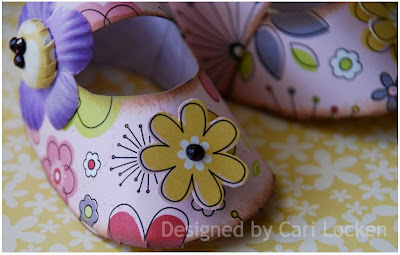 If you're interested in creating these little booties here's a few links to check out with templates and instructions. Thanks again for joining me today. Have a fabulous day! omg! these are just gorgeous Cari. those boots - do they come in my size??? LOVE them. Your "L" sign is so cute. 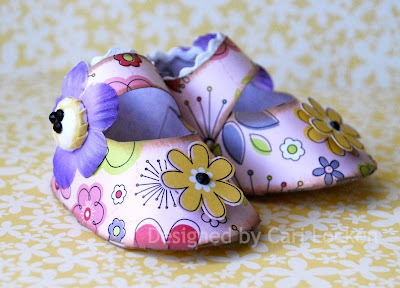 and those booties, what a cute centerpiece for a baby shower, or even just on a mantel somewhere. SO cute. TFS. Thank you for the templet for the shoes. They are so cute. Oh those are precious! what an adorable project! I LOVE what you've done here! Those little booties are just way too cute!